known as the Frogspawn Coral, this coral looks like a spawn of frogs eggs or very small grapes! The Frogspawn Coral Euphyllia divisa is a definite favorite large polyp stony (LPS) coral. The flowing tentacles and tips are very colorful, and when combined make for a really cool display. The scientific name is taken from having polyps that are divided at the end. Hence its popular common name Frogspawn, as well as a couple other common names including Octopus Coral, Honey Coral, Wall Coral, Zig-Zag Coral, and Fine Grape Coral. The identification of the E. divisa is determined more so by the shape of the polyp than their delicate skeletal structure. There are a number of colors the Frogspawn Coral comes in. Tentacles can be tan to brown or green to yellow, and the contrasting tips can be pink, lavender, white or cream. At times the Frogspawn Coral is inaccurately called Grape coral. However the Grape coral Euphyllia cristata does not have branching polyps, and each tentacle is perfectly straight with one contrasting tip. The Frogspawn Coral can be easy to moderate to care for. Like others of its genus, it will be the first to warn you that the water quality in the tank is less than acceptable. 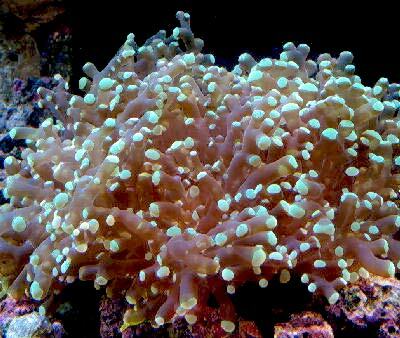 It is recommended to people who have had some LPS experience with species like the Elegance coral. Some commensal shrimp enjoy the protection of its tentacles, tentacles that will sting nearby corals to make room for more growth as well as provide tasty meals! The E. divisa has been propagated in captivity. It is readily available in stores and online and is one of the less expensive Euphyllia species. These corals are not hermatypic, which means they do not contribute to reef structures. Yet in the wild it takes 2 years for a colony to repopulate, and there is concern about over collecting these corals. In some countries they have been outlawed for collection. Propagating these corals is very important in preserving the wild colonies. While E. divisa is not illegal to own YET, it's cousin E. paradivisa which is the branching version may be very soon. This video shows a great close up of the tentacles and the little tips that are found in multiples with tiny off shoots. The flow is just about right in this video and light should be moderate and the Frogspawn should never be put directly under Metal Halides. Minimum tank size is 50 gallons, yet a full sized colony can reach 3 feet, so keep this in mind! This Frogspawn Coral video is just to show one of the variations in color. This one is green with pink to purple tips. This color combination can vary from deep green with purple to pale green with pink tips depending on the lighting. They will constantly bud from the base and provide you with a steady income if you feed them daily and give them proper water chemistry! Euphyllia Coral Information: The Frogspawn Coral Euphyllia divisa was described by Veron and Phichon in 1980. Other names this coral is known for are Fine Grape Coral, Octopus Coral, Honey Coral, Wall Coral, and Zig-Zag Coral. Where Euphyllia Corals Are Found: E. divisa are found in the Philippines, Indonesia, Fiji, and around Australia in the Great Barrier Reef and Houtman Islands. Euphyllia Coral Habitat: The E. divisa are found on muddy substrates and reef slopes to depths of 131 feet (40 m). They form small colonies in waters that are turbid, yet gentle, and enjoy indirect bright light. They also have stinging cells to help capture small prey and to defend themselves against predators. The E. divisa is not on the IUCN Red List of Endangered Species. What do Euphyllia Corals look like: The identification of the Frogspawn Coral E. divisa is determined more so by the shape of the polyp and not necessarily their delicate skeletal structure. They form large colonies with corallite walls forming on the outer edges with the polyps having the ability to completely retract into the skeleton. Polyps extend during the day and only partially at night. The tentacles of the Frogspawn Coral have thick, lumpy long polyps that have little "tips" dotted throughout the length, and will branch with some "double" skeletal heads and single heads. The colors of the tentacles can be chocolate brown to tan, and green to yellow green with pink, lavender, white or cream tips. When feeding, the individual tentacles can elongate 2 to 3 times their normal state. Some colonies can reach over 3 feet (1 m). Lifespan is unknown. Euphyllia Coral Care: The E. divisa can be moderate to easy to care for. Provide sufficient lighting and good turbid water flow, that is neither too strong or too weak. The availability of passing food will also contribute to their success. Using trial and error, by placing coral specimens in different areas of the tank, will eventually result in locating a favorite spot. This will be evident by full polyp expansion and feeding. Due to collection procedures, they are often broken from parent colonies in the wild. A specimen may have soft tissue damage, especially if the skeleton has splintered into the fleshy polyp area. When purchasing your coral, make sure it has been in the store for a week or so and doing well before bringing it home. This will help you avoid a potentially sick coral, since they may take a few days after shipping to show ailments. Euphyllia Coral Feeding: The Euphyllia corals, like other large polyp stony (LPS) corals, have developed several feeding strategies. Through a symbiotic relationship with a marine algae, known as zooxanthellae, they receive many of their nutrients. They also capture planktonic organisms, food particles from the water column, and can absorb dissolved organic matter. In captivity, mysis, krill, brine shrimp and other smaller items can be fed. These corals can eat surprisingly much larger chunks of food as well. Chop up or dice whole fish or shrimp and feed the entire organism to the coral. Since different parts of the animal have varying nutritional qualities, this practice of feeding your Euphyllia in such a way will yield good results. These corals are hungry all the time, so feeding as needed with various foods is helpful. Typical water changes of 20% a month, 10% biweekly, or 5% weekly are needed. It has been noted that 5% weekly water changes replenish many of the needed additives and it is ultimately cheaper than purchasing additives for the water. With higher concentrations of coral with calcareous skeletons though, there may be a need put in additional additives to maintain proper levels for good growth. A well-feed live rock/reef environment is what is needed for your Frogspawn Coral, along with some fish for organic matter production. A mature tank is recommended. Be sure to have proper water movement. Water flow that is too strong can cause the polyps to not extend properly thus inhabiting their ability to capture food. Provide sufficient lighting, they enjoy indirect bright light. Do not place directly under metal halides or its polyps can be damaged, which can lead to rapid tissue necrosis or RTN. Make sure that no other corals can come in contact with your Euphyllia. This coral can be aggressive, especially when hungry, then their sweeper tentacles can reach over 10" (25 cm). Feeding them regularly will help alleviate this problem. Marine Lighting: Moderate to strong, yet diffused light, but no direct metal halides. Water Movement: Moderate / turbulent. Water Region: All areas of the aquarium, depending on light and water movement. Euphyllia corals can be aggressive if touching other corals and should be positioned away from all other corals. The Frogspawn Coral is peaceful to its own genus, but will attack other genera within its family. When hungry, their sweeper tentacles can reach over 10" (25 cm) in large colonies, which poses a threat to nearby corals due to their strong sting. Feeding them regularly will help alleviate this problem. Some commensal shrimp enjoy the protection of the Frogspawn Corals tentacles that will sting nearby corals to make room for more growth as well as provide tasty meals. The E. divisa tend to be sensitive to aquariums that have large collections of soft corals, specifically, some Sinularia species. The large polyp stony (LPS) corals are male and female and can reproduce both sexually and asexually. In the wild they reproduce sexually by releasing eggs and sperm at the same time, resulting in a fertilized egg which then forms into a free-swimming planula larva. Eventually the planula larvae settles onto the substrate, becoming plankters. This then forms a tiny polyp which begins to excrete calcium carbonate and develops into a coral. Planula larvae are extremely vulnerable to predation, and very few survive. Euphyllia genus reproduce asexually as well. In captivity, the E. divisa will bud off small groups of polyps with little skeletons attached. They will also pinch off their own tentacles, which then floats off, and being sticky, will reattach and start a new colony. To propagate you first you need to choose a healthy coral that is not showing any signs of distress. Propagation should be done with an electric saw at least 1 1/2" to 2" away from the top. Do not use a bone crusher or scissors, since they will splinter the skeleton and harm the polyp. Glue the frag to a plug or rock. You can use the 2-part epoxy or underwater putties.The slime that the coral will exude should not come in contact with any other corals and gloves are suggested. Give the frag ample water flow. The Euphyllia spp. are fairly hardy, but are susceptible to a few maladies. The E. divisa is susceptible to brown jelly or protozoan infections, collection problems, and intense lighting. Brown jelly or protozoan infections can infect the rest of the colony if not treated. This brown jelly looks exactly like it sounds, and can be caused by poor water quality and/or tissue damage. To treat, remove the coral to a container with water from the main display, then brush or siphon off any visible brown jelly. Give the coral a freshwater dip in water with the same pH and temperature as the main tank for several minutes to kill a lot of the microorganisms. Use an antibiotic paste on the infect areas and/or a Lugol's dip. Cyanobacteria and brown jelly infections can be treated with Neomycin sulphite, Kanamycin and other broad-spectrum antibiotics. The pill can be pulverized into a fine powder, mixed with sea water to make a paste, and then applied to the wound, or affected site of the coral with a simple artists brush. Try to treat the coral with the least stressful method first. Place in a quarantine tank until coral recovers. Do not place directly under Metal Halide, or the E. divisa's polyps can be damaged and can lead to rapid tissue necrosis or RTN. Collections from the wild may have soft tissue damage, especially if the skeleton has splintered into the fleshy polyp area. When purchasing your coral, make sure it has been in the store for a week or so, since they may take a few days after shipping to show ailments. Euphyllia Corals for Sale: The Frogspawn Coral E. divisa is very easy to find at pet shops and on line. Online they can run about $39.00 USD or more depending on size and/or color. I've had mine for about 3 months, although it was owned by my co-worker for a number of years. I love it, it is my prize coral, with a maroon body and neon green tips. If you're thinking of buying this coral it's a good addition, but placement in the tank can be tough. Just try to face it up so ALL the polyps get light, not just the biggest ones. And try to place it somewhere without TOO much flow, but it does need some flow. I recommend feeding it squid once a week, a little bit to each poyup head, and maybe zooplankton once a week, but not on the same day. I had the soft heads of mine eaten by an emerald crab. Any chance it's still alive and may grow back? Any way to deter the crab from eating it again? I have had my frogspawn for several months. It is a beautiful pink shade. It seems to be very happy sitting on the sand in the aquarium. Since I have owned it, it seems to have grown new branches. I do not have it near any other coral or creature that it can sting. However, many of my fish swim under and around it all the time. It has been a great addtion to my aquarium and has not been difficult to care for at all. Have had this coral for a few days now and love it. I had to mount mine to live rock using a two part epoxy to keep them from tumbling over. Neon green frogspawn is the best looking in my opinion.